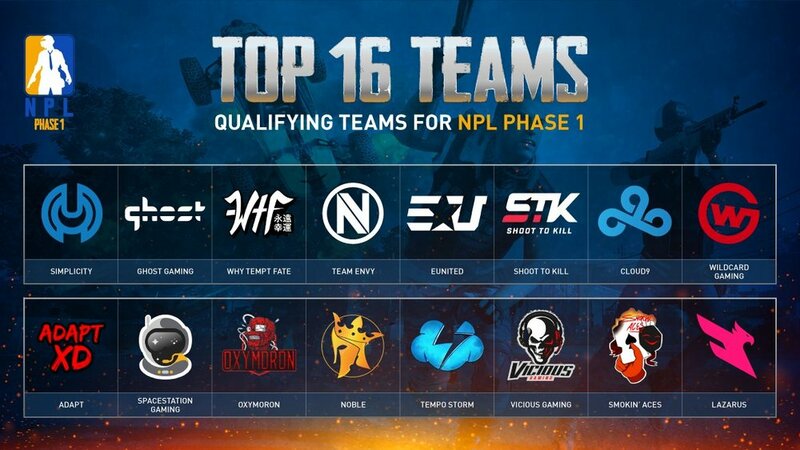 Online and LAN qualifiers have been held to finalise the teams that will be competing in the inaugural PUBG leagues, and while there were few surprises in who missed out on getting into the top leagues (Method and Reciprocity not making it in EU and Team Gates not making it in NA are the main ones that stood out to me) it didn’t stop these qualifiers, that were not officially considered to be a top tier event in themselves, from being some of the most entertaining games PUBG has put on – particularly in North America. The official final for the NA “Pre-Season” fizzled out, in part due to the resetting of points after 6 days of play to inexplicably have a best of 4 free for all to get the money, but the actual elimination games were fantastic. The recently signed team of Simplicity fired a warning shot, not only to North America but also to the rest of the world with a dominant display that saw them finish head and shoulders above the rest of the pack, and an outstanding last day of play from the experienced Ghost Gaming saw them jump from 10th to 2nd overall, but as you can imagine, in an elimination competition, it was closer to the cut off that things were the most interesting. Due to the format of the tournament, heading into the last day, half the teams had already played all of their games. They had to sit and wait for the other 16 teams to play their final 4 matches to determine if they would make it into the Pro League or be relegated to the Contenders League. There were smaller teams such as Smokin’ Aces who had no games left to play but looked like they had probably accumulated JUST enough points to scrape in (though it was going to be a long day) and big name teams such as Tempo Storm and Noble that had 4 games to turn around what had been dismal tournaments for them both up until that point. The expectation for both Tempo Storm and Noble on that final day was that they would get an early win and put themselves in position to comfortably make it in with a game or two to spare, but that was not the reality. Heading into the final game of the qualifying phase, Noble had 1954 points (at 178 points per game) and Tempo Storm had 2094 points (at 190 points per game). They would both need to REALLY outdo their performance in the prior 11 games to get past the 2400 points mark and give themselves a chance to scrape into the NPL. With 2 big teams both desperate to get a top 3 finish (at least) and rack up as many kills as possible, it seemed unlikely that they would not come across each other in game and one of the teams be wiped out. Their fans needn’t be worried though as the experience from a multitude of big tournaments that both teams had played in ended up creating an amazing final game where both teams finished top 3 with almost half the kills available between them. Noble got a whopping 688 points and Tempo Storm got 456 points with both teams making it through comfortably in the end. It set the scene for what is anticipated to be a thrilling season, and gave a window (for me at least) into how PUBG can use the disadvantages it has as a spectator esport as advantages. The suspense was brilliant, but because of the chaos of 16 teams, it didn’t end as soon as the match finished. It seemed like they had both done enough, but nobody could know for sure until the final scores were officially announced. We got to see not just the reactions of the players jubilant at a win, but also the range of emotions that they went through as they waited to find out if what they did was enough. It’s certainly something for both the broadcasters and competition organisers to think about if they want to push PUBG into the top tier of the esports world. Which brings me to my preview for phase one of the NPL. The matches begin February 1st – less than 3 weeks after the end of the NPL – but teams have had enough time to learn from their Pre-Season games, make adjustments and take their improvements into scrims. The format of the season is such that at the end of Phase 1, the top 10 teams will be confirmed to continue in the NPL while the bottom 6 teams will have to play for their survival in the Phase 1 Relegation battle against the top teams from the Contenders League. Interestingly, the teams in the NPL break into 3 different types. There are the Experienced Teams that have been playing at the top level in NA since the beginning, the Established Teams that haven’t been around as long, but their consistent strong results have established them as a threat, and the teams that have made their name in the NPL and are striving to move up into the established tiers.